Giving all the attentions. Photo by Alvin Gellert. It’s been a week since Logan died. I miss the little red horse so much — driving into the barn area is particularly hard because there is supposed to be a red head going up, ears up, and a hrhrhrhrhr of hello. But there isn’t, because he’s not in the paddock anymore. It’s often said that when a door closes, another door opens. 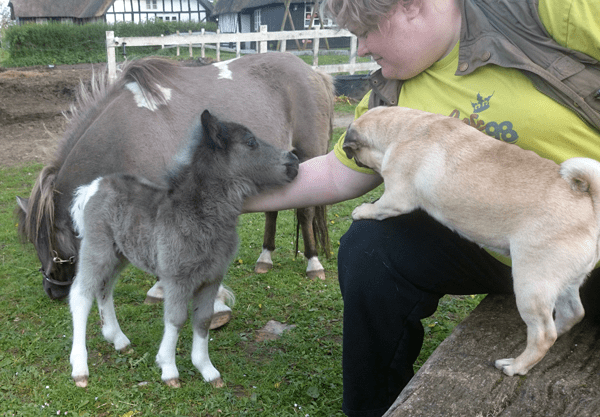 About an hour after Logan’s body had been picked up for destruction, little Halo was born to shetland pony Lucy, who had gone at least a week over time. I have gone out to the barn several times this week to sit and watch mother and daughter, because watching new life and happiness is by far preferable to sitting at home and feeling the loss. Besides, there is nothing quite so adorable on this planet as a teeny tiny shetland pony baby. Life does go on. You know that advice people will always give about buying horses, the “Never buy the first one, take your time to look around” bit? Yeah, I ignored it. Hopefully tomorrow, and definitely this week, I intend to become the proud owner of a six year old Friesian mare by name of Diamond Pilar.